In the midst of the confrontations currently raging across multiple eras in the primary timeline, there have also been incidents of incursions into entirely alternate realities. One such breach has resulted in many artifacts and technological oddities from another timeline getting pulled into our own. A closer examination of this timeline reveals that it is a divergent reality that split from our own as a result of a confrontation in the 23rd Century, between an unknown Romulan vessel that had been displaced from the time stream, and a Federation starship - the U.S.S. Kelvin. As a result of this temporal incursion, the entire timeline that followed those events has come to be called the "Kelvin Timeline." Examination of the time-lost salvage taken from the Kelvin Timeline reveals that the Federation of that reality had a decidedly higher emphasis on military technologies, likely as a direct result of their overwhelming defeat at the hands of the alien vessel that invaded their space in the 23rd Century. The same has shown to be true of the Klingon and Romulan ships of that time. This emphasis on cutting-edge technology allows their starships and equipment to be comparable with our own in the early 25th Century, despite technically being hundreds of years old. A small group of industrious scientists have taken it upon themselves to replicate these designs, and distribute them throughout the modern era. It is thrilling to finally have the opportunity to include assets and characters from the recently-rebooted Star Trek movie franchise in Star Trek Online. The 2009 film Star Trek, and its follow-up Star Trek Into Darkness, brought Trek back to the forefront of modern science fiction media, revitalizing the franchise with action and style for existing fans, and a whole generation of new ones. Time travel and dimensional shifts have presented us with the perfect storytelling tools to allow such a crossover as something that could reasonably exist within our “prime” timeline. The Kelvin Timeline will be presented in the story of Agents of Yesterday in the form of a dimensional incursion that your characters, as Temporal Agents, will be tasked with finding a way to set straight. While visiting this alternate reality, players will interact with characters and starships pulled directly from the silver screen. And now, by obtaining and opening a Kelvin Lock Box, some of those same ships and technology can be used to defend time itself from those that would manipulate it for their own selfish gains. Unlike most Lock Boxes from the past, the Kelvin Lock Box will reward players from each faction – Federation, Klingon, and Romulan – with different starships if they win the Grand Prize. Federation characters may find themselves fortunate enough to win the Kelvin Timeline Heavy Command Cruiser [T6]. Also known as the Constitution-class, this formidable vessel is a true Command Cruiser in every regard, including the ability to utilize Inspiration mechanics, and coming standard with a Commander-rank Command Specialist Bridge Officer Seat. Klingon captains that win the grand prize will find themselves rewarded with a Kelvin Timeline D4x Bird-of-Prey [T6]. This extremely nimble raider is fully outfitted as a true Pilot vessel, including Pilot Maneuvers and a Commander-rank Pilot Specialist Bridge Officer Seat. Captains from the Romulan Republic will also be given the chance to win a unique starship prize – the Kelvin Timeline T’laru Intel Carrier Warbird [T6]. Outfitted for reconnaissance and striking deep behind enemy lines, this ship is a true Intelligence starship capable of utilizing Gather Intelligence and a Commander-rank Intelligence Specialist Bridge Officer Seat. This is in addition to its innate Battle Cloak, and two hangar bays of Kelvin Timeline Scorpion Fighters. While players from each faction will not have the opportunity to win the starships from the other two factions, we are including both a Cross-Faction Console Pack and Cross-Faction Starship Trait Pack as high-tier prizes. Opening any such pack will grant players the option of unlocking access to the Console or Starship Trait associated with starships from the other factions. 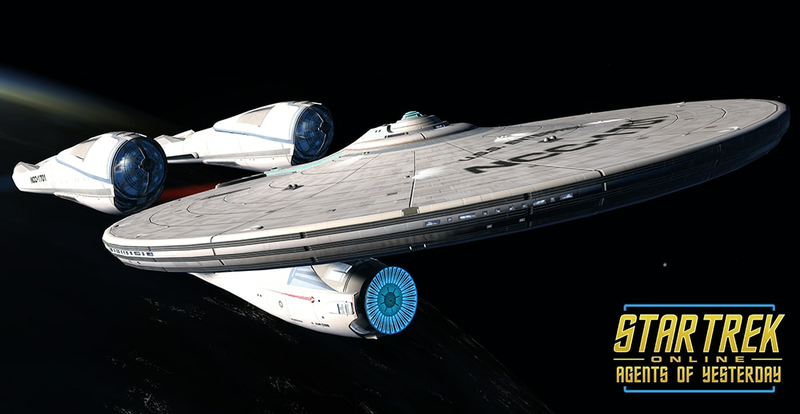 Due to this cross-faction availability, all of the above Consoles may be equipped on any class of starship. Last in our new starship offerings, but certainly not least, is the devastating and imposing Kelvin Timeline Intel Dreadnought Cruiser [T6], also known as the Vengeance-class. The Lobi Store will see the addition of easily the most massive and powerful Intelligence vessel ever offered. It is capable of making use of Gather Intel mechanics, as well as coming with a Commander-rank Intelligence Specialist Bridge Officer Seat. When damaging any foe with Cannon: Scatter Volley or Beam: Fire At Will, gain a stacking bonus to outgoing weapon damage for a small amount of time. The ability to purchase and fly the Kelvin Timeline Intel Dreadnought Cruiser [T6] will be restricted only to Federation characters. However, Klingon and Romulan captains will instead be offered the ability to purchase a Kelvin Dreadnought Package from the Lobi Store which includes both the Console and the Starship Trait unlock for a lower price than that of the full starship. But there’s more to the Kelvin Lock Box than just ships and their associated equipment! In addition to the ships and technology scavenged from the alternate reality, there are also personnel that have made the leap across the universe’s boundaries and become stranded (for now) in our reality. These brave Kelvin Timeline Federation Officers are willing to offer their considerable expertise as Duty Officers with brand new Active Roster Abilities that are designed specifically to interact with Specialization Bridge Officer Abilities (Intel, Command, and Pilot). A total of 10 exciting new Active Roster Abilities are ready to synergize with your favorite Specialist Abilities, for both Space and Ground scenarios. Players may also obtain a new set of Genetic Resequencers in order to unlock access to two new Ground Traits, and two new Space Traits. Receive a substantial damage resistance rating bonus against any foe that you have not damaged within the past 20sec (or have never damaged). If any drones/constructs are within the affected area they will violently explode dealing Electrical Damage to other nearby foes. Cone AOE Disable, but also Disables Self. Both Foe and Self effects are Fragile, and will break if receiving any damage. When Self Disable expires (or is broken via damage) you receive a substantial Damage Bonus. In addition to Kit Modules, players will be able to obtain Bridge Officer Training Manuals for Ranks I, II or III of any of the above abilities. The Rank I version of each ability will be Ensign, while Rank II is Lieutenant and Rank III fills a Lt. Commander slot. Rounding out the offerings of new equipment will be new unique Space and Ground Weaponry. When opened, each Kelvin Timeline Weapons Pack will offer the player a choice between Space Weapons, Ground Federation Weapons, or Ground Klingon Weapons. Within the Space Weapons choice, players will find either a Kelvin Timeline Phaser Emitter Array, or a Kelvin Timeline Photon Torpedo Launcher. The Emitter Arrays feature unique visual effects which resemble rapidly firing cannons, but are built to take advantage of beam firing modes and have similar firing arcs to beams. Kelvin Phasers have a chance to briefly disable the targeted foe, and all other foes within a small radius around the primary target. Kelvin Timeline Photon Torpedoes share most of the same attributes as standard Photon Torpedoes, except for coming standard with a [Reload] modifier which allows them to recharge more quickly. Kelvin Federation Ground Weapons come in either a Phaser Stun Pistol or Phaser Sniper Rifle variant, and feature a special effect that inflict a short duration Hold on the targeted foe and all other foes within a short range of the primary target. Kelvin Klingon Ground Weapons come as either a Disruptor Compression Bolt Pistol or Disruptor Full Auto Rifle, and feature a special effect that can inflict a damage resistance debuff on the targeted foe and all other foes within a short range of the primary target. Uniforms worn by personnel in the Kelvin Timeline are also being made available on the Lobi Store. There are separate Kelvin Timeline Uniform Packs for Federation, Klingon and Romulan players, each offering a large assortment of new customization options for you and your bridge crew. And what would a foray into the Kelvin Universe be without seeking out the most powerful anti-personnel weaponry found in that war-focused alternate reality? A new handheld assault weapon, known simply as the Boolean Heavy Assault Cannon, can be purchased from the Lobi Store. This devastating and enormous weapon is actually repurposed ship-mounted weaponry, slightly modified to allow for use on ground combat. Its primary and secondary firing modes can completely devastate enemy foes, though they have longer recharge times than most other ground weapons. As a unique tertiary firing mode, the gun can be used to sweep nearby enemies off their feet in a circular area around your current position. The Kelvin Lock Box, and the new offerings appearing on the Lobi Crystal Store, will become available with the launch of Agents of Yesterday beginning on July 6th, 2016.